Underwater Obstruction for Boats/Locks etc. The Truxor Harvester can be fitted with dredging and silt pumping tools allowing silt to be removed safely and easily. 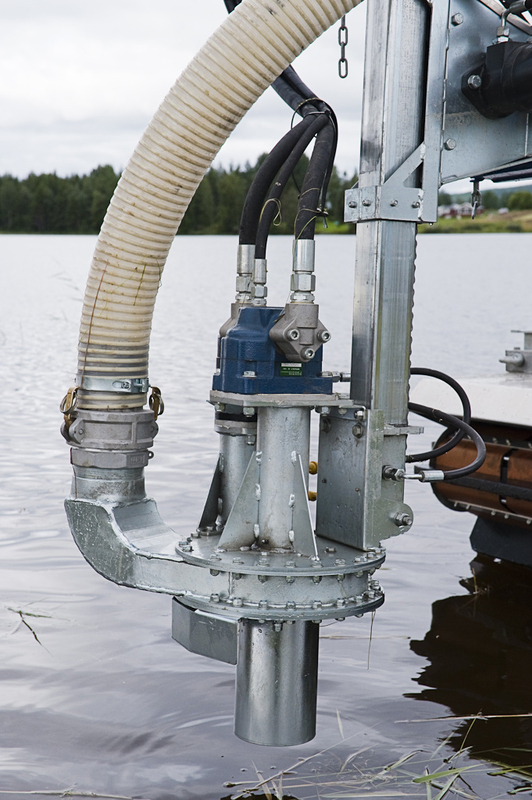 The Doro Pump (pictured above) allows us to easily access the problem areas and pump large quantities of silt, up to 300 meters away into specific containers (more on this below). The Grab Bucket can be used to dredge silt from the bottom of the water course and transport it to a nearby bank or other designated area. This can be particularly useful on stone or gravel beds. There are numerous containers that can be used to pump silt into. This usually depends on the surrounding area of the watercourse itself and amount of silt that needs to be removed. As the material being pumped will always be a mixture of water and silt, certain jobs require the separation of the silt from the water before being removed from site. While some options allow for a continuous stream of pumping, others work on a 'fill and drain' system. It all depends on the site and the immediate environment of the watercourse.